Reading Marj's obituary in Macleans today reminded me that I've had this post sitting here for a month. The author of that one had the daunting task of trying to encompass an entire life in a few hundred words. I thought Tannis captured some of Marj's spirit recently too, but I haven't been able to write yet. All I've got is scraps of memory of shared experience, a bunch of old e-mails from her over the years, some photos, and the hole left behind. I've been reluctant to post anything about it because there are so many people who were closer to her, people who are hurting more, and will hurt for longer. Yet we all have our own story. I make no effort to capture who Marj was overall, because I've come to see that I have no idea -- she was connected to hundreds of people in unique, often quiet ways, many of which will never be heard. What a woman -- larger than life, a force of nature and the master of laughter. An inspiration too, in so many areas of life -- someone who wasn't afraid to buck the trends and forge her own path. She was unconventional, and thank goodness for that. I often said, "man, Marj is such a piece of work!" Always as a term of endearment, of course. Telling stories about Marj should be easy, yet our dynamic tended to center around Marj telling us stories. How to remember properly when the chief storyteller has left? Aunt Helen used to say that my grandma was the best listener, a good foil for her, laughing and exclaiming at her hilarious accounts of everything. I think we're a clan of listeners, laughers and prompters, often dependent on an intense character like Marj to bounce off of. Not that she didn't listen to our feeble attempts at telling her what was going on with us, but she tended to drive the bus, steering into the areas that interested her most. 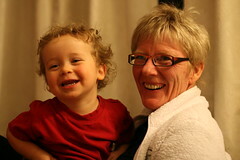 (As an aside, I love this photo on the right -- Ella took the picture with Marj's camera on a walk near our place). 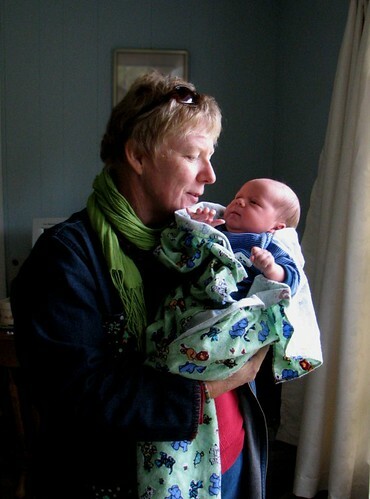 Everyone who knew Marj knows how much she adored babies, no matter how homely or descended from total strangers. She treated our kids like rock stars, like they were the *most* important people in the universe...well, maybe not like rock stars, considering all the tickling, hanging upside down, crazy shrieking and bags and bags of cute little clothes. It boggles the mind to imagine all of the children she must have poured love into over the years. "I should have known to bring the REAL camera to do any kind of justice to your gorgeous children. Wow. They are really something else. Not just gorgeous, but delightful and most, most precious! What good parents you are! Thanks for your warm welcome and for letting me put that little Ezzie to sleep." She was the best fan to have, someone who never hesitated to say stuff like: "Know that you are one of my favourite people in the whole wide world!" We could all learn from that example and be better supporters and advocates for the ones we love. Of course later I realized that I was one of her 567 favourite people in the world, but that doesn't diminish the memory one bit. "Jen is more beautiful and together every day." Kate: "She's a dear, strong, wonderful woman, that's for sure." About one of Billy's moves: "I will try to cook something delicious every day till he leaves so he will come back to his mama!" From an e-mail to Shawna that she shared with me: "My three daughters – Jen, Kate and Sara - have grown up to be fine women with great spirit, heart, hopes and dreams! Their baby bro Billy is also growing into a lovely young man." "So now I have given you the low-down on all the kids. Not sure why, but I am so full of mothering them and need to spill some of my pride and joy out now and again." 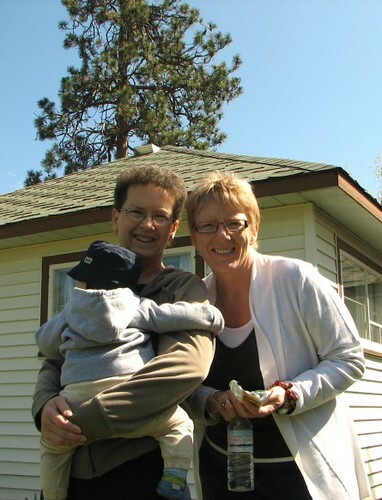 Our connection to Marj over the past decade greatly benefited from her work partnership with my mom. 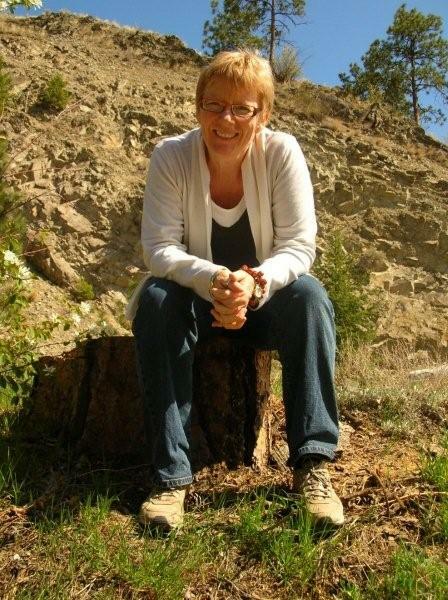 It meant that she'd fly out to the Okanagan once or twice a year and we'd usually get to see her between her frequent, frenzied shopping excursions and bits of work. 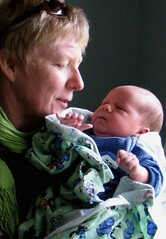 Mom was often in awe of Marj's energy, incomprehensibly busy social schedule and prodigious schmoozing (sales!) skills. And Marj couldn't believe anyone could be as efficient, detail-oriented and productive as Mom -- she'd say "oh, you always make me look SO SMART!" They were excellent buddies, in daily contact for a decade, and doing amazing, valuable work together. With a lifetime of friendship, growing up not far apart as cousins, they knew how different their personalities were. When the partnership worked best, their divergent skills complemented each other perfectly -- the flamboyant people-person out in the field and the diligent back-office person keeping things organized, productive and on-track. Yet those differences also caused plenty of strain for both of them -- running a company together several provinces apart would be a challenge for any pair -- and unfortunately the last year of their work together was very difficult. It made it hard to be buddies, and I'm so thankful that they were able to rekindle their friendship in the months before Marj's death. 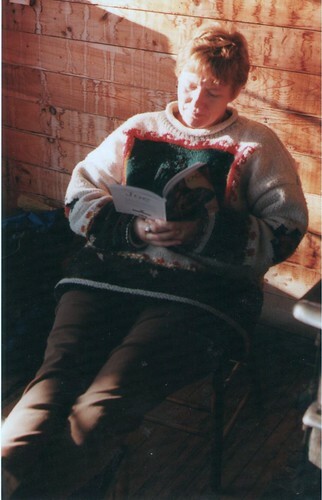 The picture below is a bad scan of one of my favourite photos of Marj, taken on a glorious fall day at the Shack around 1997. I think it was Jim, her and me for most of the time; a whole afternoon of quiet, beauty and warmth. 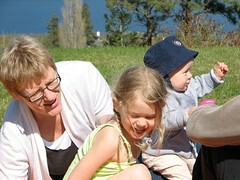 It's good for me to remember that she wasn't all about crazy stories, maniacal laughter and hurrying to the next thing. Maybe that's why I like the photo so much -- it reminds me of the thoughtful, reflective side of her. 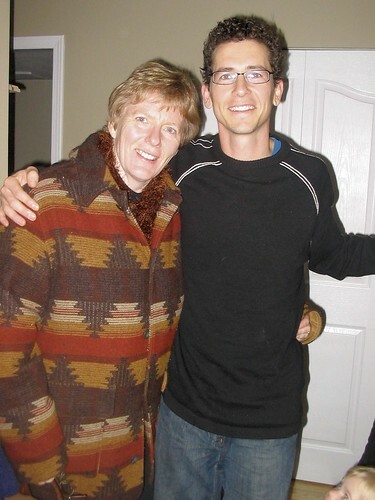 Whenever we'd see each other she'd hug me long and hard -- she remembered that the first hug she gave me after Tom died reminded her so much of his thin frame, and she'd mention it every time. Great hugger, that Marj. I still can't believe she's really gone. Agreed. Great job on this, I know how hard it was to write.